Their deathly hypnotic stare sends shivers down the spine. The long, strong neck gives these amazing creatures additional cause to be feared. Hyenas are infamous for their ferocious ways of hunting in packs (known as cackles, or clans), scavenging carcases and loudly, excitedly, yelping as they rip their food to pieces. There are four living species of hyenas; the spotted hyena (Crocuta crocuta), the striped hyena (Hyaena hyaena), the brown hyena (Hyaena brunnea) and the lesser know little aardwolf (Proteles cristatus). The striped hyena is the only species, in present time, to live outside of Africa; as well as north and east Africa, it also lives in the Middle East and Asia. In the Earth’s recent past, another species of hyena was running around Europe; cackling across the plains. 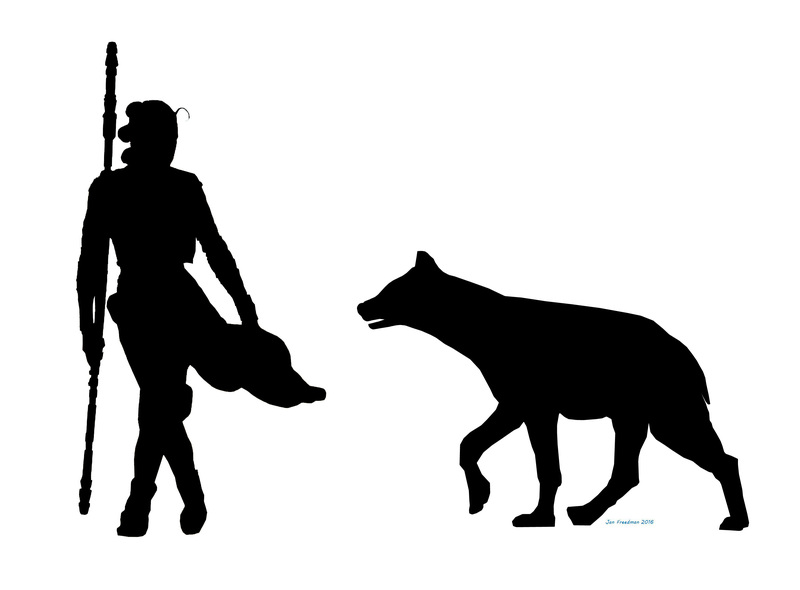 Hyenas are one of the keystone species excavated in the first Pleistocene fossil discoveries. In the early 1800s in England, fossils in caves were being dug up by limestone quarrymen. At first thought to be old farm animals they were used for adding to road rubble, but they soon attracted the attention of naturalists, and one man in particular became obsessed with them. The somewhat eccentric William Buckland, a geologist and theologian in Oxford, was made aware of one of these early sites at Kirkdale Caves in Yorkshire. Bone of hippopotamus, elephants, bison and other creatures were all identified. A strong believer in the literal truth of the Bible, Buckland first thought that the remains had been washed in by Noah’s flood. The more he looked, the more he realised that the giant beasts could not have been washed through the small opening of the cave. How else could they have got there? Abundant fossils of another creature gave Buckland the answer. Fossils of hyenas, young and old, along with gnawed bones of animals and fossilised hyena poo (called coprolites) provided evidence of hyenas actually living in the cave. Clans of hyenas were denning in the caves, dragging in bodies of the animals which lived nearby. Far from confirming the Biblical account, Buckland had discovered a time when these exotic creatures were living in Britain (he attributed this to an ‘antediluvial’ time, or a time before the great flood). By examining hyena fossils and looking very closely at other fossils (for gnaw marks), Buckland had set a new standard for examining cave sites. The spotted hyena (C. crocuta) has been incredibly successful throughout most of Europe and Asia for almost a million years. Commonly known as the European Spotted Hyena, or the Cave Hyena, this hyena has historically been named as a separate species (C. spelaea) or sub-species (C. crocuta spelaea). Recent genetic work has demonstrated the European Spotted Hyena has had continual gene flow through Africa and is one species, C. crocuta. The first evidence of C. crocuta in Western Europe is found in Sierra de Atapuerca, Spain, dating to 800,000 years ago. They rapidly spread throughout Europe and are one of the main fossils recovered from many cave sites. Beautifully preserved jaws, and skeletal remains, have been found in caves in Somerset, Devon and Yorkshire. As Buckland demonstrated for the first time with the fossils at Kirkdale in Yorkshire, many of the caves sites across Europe have young and old specimens indicating that they were used as hyena dens. These hairy terrors were not restricted to warm environments during the ever changing Pleistocene. Their remains have been found throughout the mid-late Pleistocene of Britain, including times when it was so warm hippopotamus swam in the Thames, and later, cooler, times when mammoths roamed Derbyshire. Although they are absent in Britain during a few extremely frigid periods, these were efficient, successful predators. They suddenly became extinct in Britain around 30,000 years ago, and soon after in the rest of western Europe. It is likely that changing climate and changing vegetation had an effect on populations. Around 30,000 years ago the climate was colder and the prey species were becoming isolated in refugia. With the colder climate and less herbivores, these great beasts would have had more competition from wolves and even lions. They were lost from Britain and Europe. Fortunately, this Twilight Beast survives today. Watching one (on the television), you can imagine clans of these incredible animals yelping and cackling all over England. Turner, A., Antón, M., (2004), Evolving Eden: An Illustrated Guide to the Evolution of the African Large-Mammal Fauna. Columbia University Press, New York. 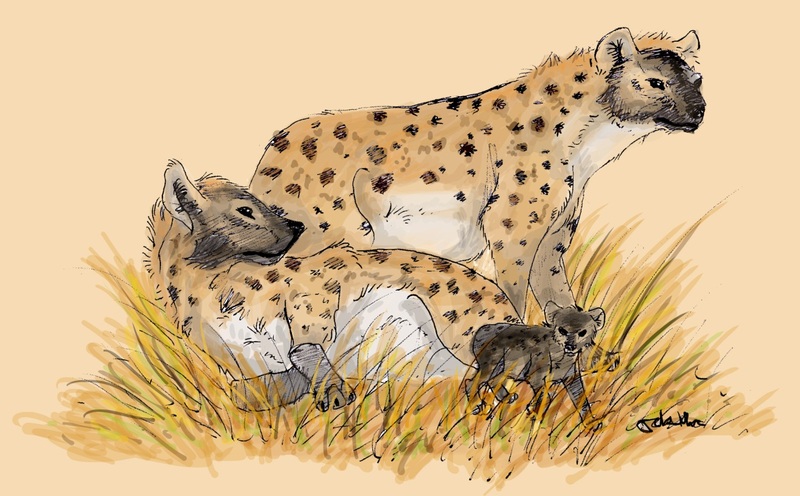 This entry was posted in Hyena and tagged aardwolf, Brown hyena, Byaena brunnea, Cave hyena, Crocuta crocuta, Hyaena hyaena, Kirkdale Caves, Proteles cristatus, striped hyena, William Buckland. Bookmark the permalink. Reblogged this on Palaeo Manchester.